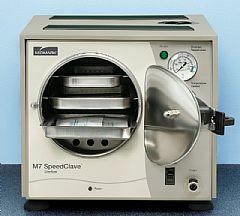 The Midmark M7 SpeedClave Self-Contained Steam Sterilizer is efficient, economical and dependable. 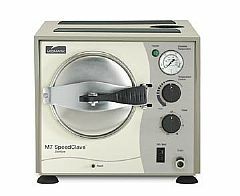 Over forty years in the field have proven the Midmark M7 to be the workhorse of autoclaves. And, with constant improvements and new technology, the M7's reliability just keeps getting better. This self-contained unit sterilizes wrapped or unwrapped instruments, linen packs and glassware. Starting hot, the M7 sterilizes unwrapped instruments in just 9 minutes. No plumbing is required as the M7 has its own reservoir for distilled or demineralized water. For added convenience, we've included three corrosion resistant, stainless steel trays. It's also economically priced, making it the best product for your money. The safety door on this autoclave automatically seals when pressurized and will not allow the operator to open the door until the chamber is safely depressurized. The temperature regulator allows the operator to preset the temperature at a desired setting between 250º F (121º C) and 270º F (132º C). This control, acting as a thermostat, cycles the heating element on and off. The temperature gauge indicates the temperature inside the chamber. The gauge is graduated in two-degree increments from 80º F (26.7º C) to 270º F (132º C). The low water cut-out switch prevents “dry burning”. The M7 autoclave will operate only when there is enough water present, which prolongs the life of the heating element. A pilot light is on when the heater is on and cycles on and off during normal operation. The cycle timer regulates sterilization time from 0 to 30 minutes and automatically turns the M7 off when the sterilization cycle is complete. This prevents over-sterilization thus extending the service life of your instruments. With our front draining feature, it's easy to clean and maintain. All controls and information are on the front and easily accessible to the operator.